Island offers various envelope systems with an impressive range of materials, including (but not restricted to) terracotta, metal panels such as zinc or aluminum, perforated and textured finishes, stone, brick, and curtain walls. Facades can be complex, and whether it is a privacy screen, louver system, balcony, or stress skin, Island has developed a system to not only accept these features, but to integrate them into the performance and erection of the wall, as a turn key part of our wall system. Island works closely with architects to make sure these elements are seamless. A hybrid that combines the features of a wall with a window where individual panels have no structural dependency with adjacent panels. These panels can achieve a variety of architectural and performance intentions that could not be achieved with traditional construction and are designed for efficient production and easy transport. Unitized curtainwalls entail factory fabrication and assembly of panels and include factory glazing. These completed units are hung on the building structure to form the building enclosure. 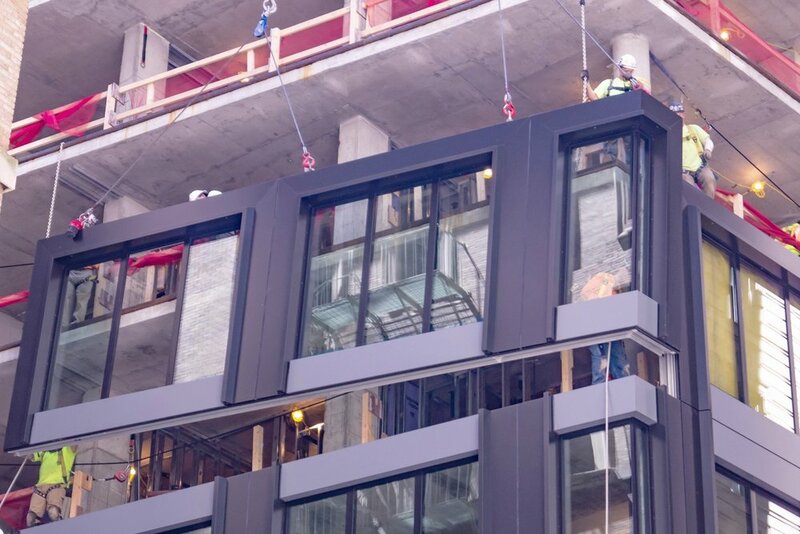 Unitized curtainwalls have the advantages of: speed, lower field installation costs, and quality control within an interior climate controlled environment. A true soup to nuts building product customized to the architectural requirements. The process includes the design, fabrication, and install of Island derived exterior load bearing, interior shear wall, hollow core concrete plank, and precast concrete stairs. Structure, envelope and egress all in one.